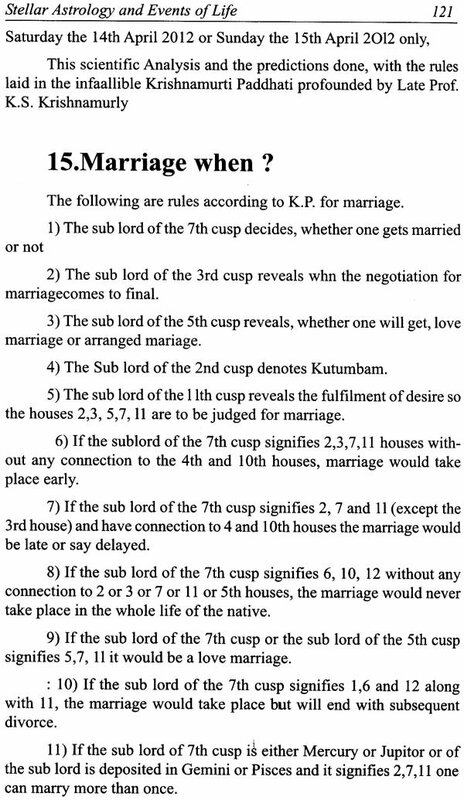 Krishnamurthy Paddhathi has been hailed as a better tool in predicting accurately modern day to day events by using the sub lord theory and the number system devised by him. In the Introductory chapters, a short introduction about the concepts of planets, signs, Houses, etc. 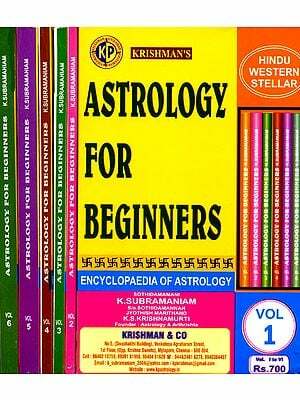 from the point of view of Steller astrology based on Krishnamurthi paddhathi has been introduced. 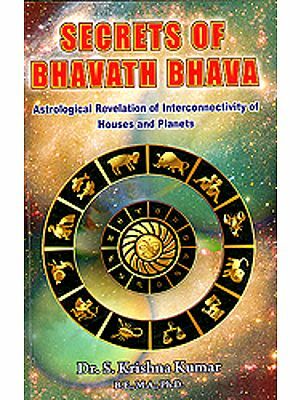 Based on Steller astrology as practiced in Krishnamurti Paddhati, the author has tried to cover important events of life, alongwith variations of such events, for the benefits of the readers, has made this book exhaustive for astrologers and students of Astrology. 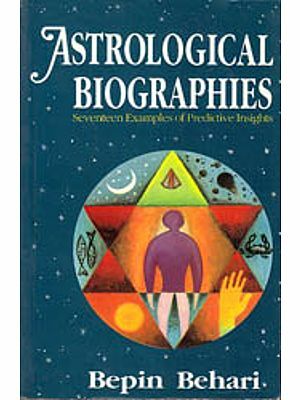 In this book, the author has extensively analysed Case studies of the horoscopes of the natives, with natal charts, cuspal charts, planetary configuration etc, and predictions have been made accurately. Each case study has been deeply analysed and predictive analysis of why of the predictions have been fully illustrated. The analysis of the case studies are itself very educating and they can be used to analyse similar situations and reach correct analysis and prediction. These horoscopes portray the different aspects or events in life which every astrologer comes across during day to day consultations. This book, in your hand-which contains formula and methodology with different tables-is inevitable in making accurate predictions, and pinpointing events.. 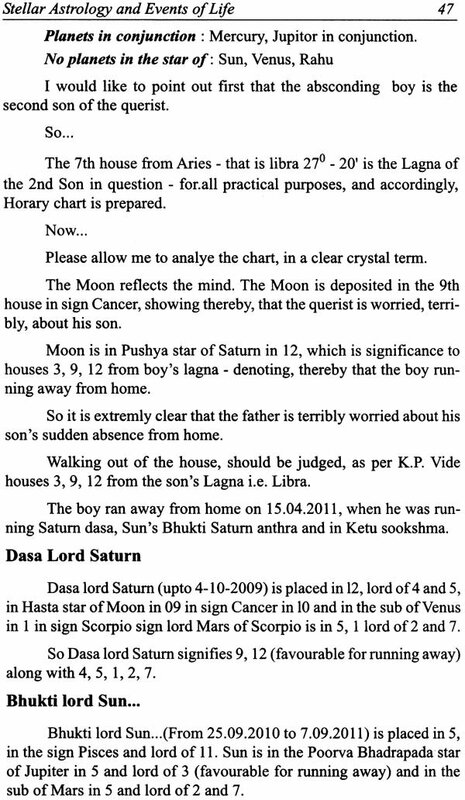 It is a must, for all astrologers and public in general. Dr.M.N. Muley, M.B.B.S., a retired Gazetted Medical Officer, Maharashtra State. 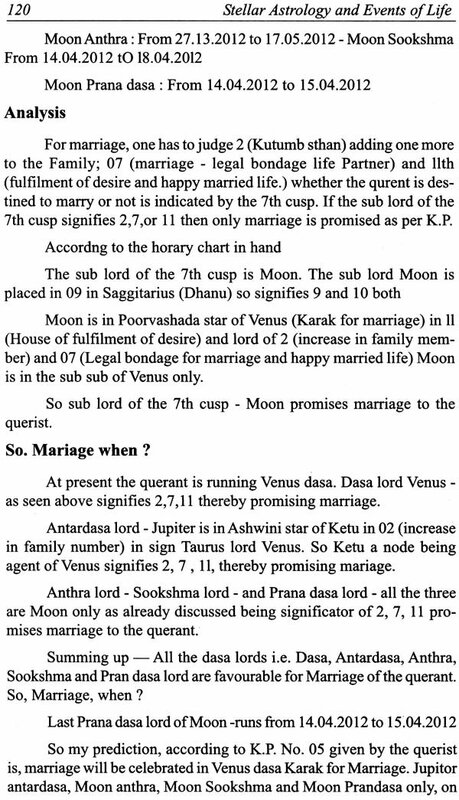 The author is a professional astrologer and is practicing Astrology, especially Stellar astrology, better known as Krishnamurti Paddhati, advocated by Sothida Mannan, Jotish Martand, Late K.S. Krishnamurty since the year 1993. He is having the degree of Nakshatra Jotishratna (K.P. System) and honoured with the title of "Bharat Jotish Bhaskar", acquiring gold medal by Jotish Vidyapeeth, Zarkhand. He is honoured with the title of "Jotish Alankar" by the World Astrological Institute and "Jotish Kaustubha" by Krishnamurty Vigyan Mandal, Mumbai, and the title of Jotish Bhaskar by Jotish Pariwar Mandal, Mumbai. The author, is a life Member of International Society for Astro Science Consciousness (Regd. ), Maharashtra Jotish Parishad (Regd. ), and World Astrological Institute. 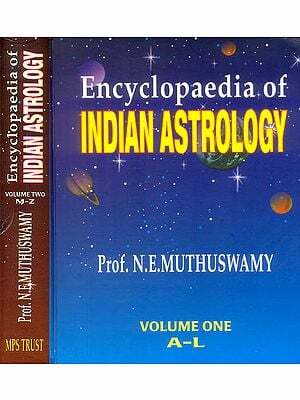 Also by the author, his earlier book on Medical Astrology - en- titled "Astrological Revelations of diseases" has been published in the year 2007, based on Krishmaurthi Paddhathi, got a thumping response from Astrologers everywhere as well as from the Medical professionals and public in general. It gives me great pleasure to write a foreword to this book titled "Stellar Astrology and Events in Life" by Dr. M.N.Muley, a retired Government Medical Officer from Maharashtra state. The author is an ardent follower of Krishnamurthy Paddhathi and being a scholar in this field and being a doctor, has developed deep interest and has established himself as a sound scholar in this field, so much so that he has been honoured with the titles "Nakshatra Jotisha Ratna (K P system), "Bharath Jotish Bhaskar", securing a gold medal by Jotish vidyapeeth, Zharkhand, and "Jotish Alankar" by World Astrological Institute, and Jotish Kausthubh by Krishnamurthi Vignan Mandal, Mumbai, "Jotish Bhashkar" by Jotish Parivar Mandal, Mumbai. 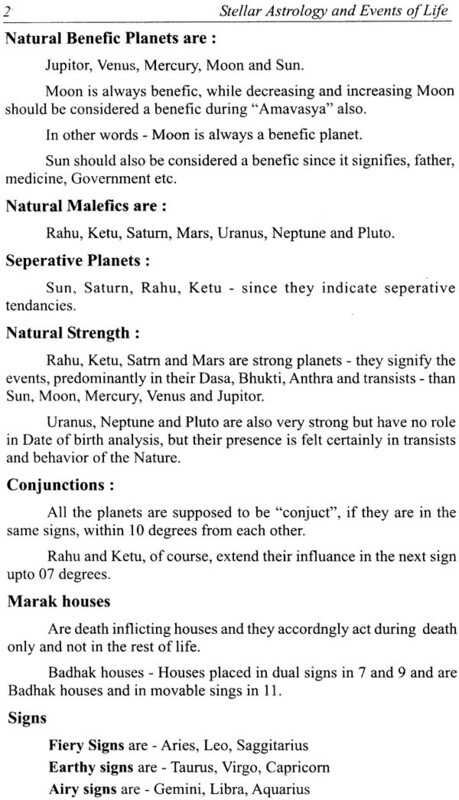 A book entitled "Astrological revelations of Diseases" by Dr.M.N. 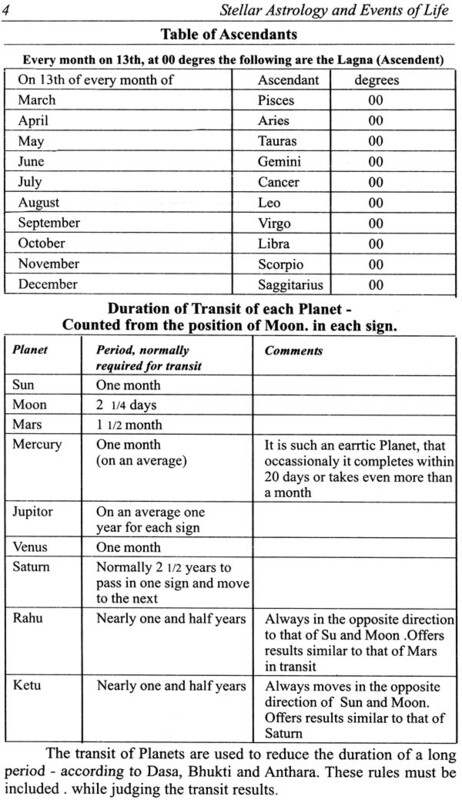 Muley has already been published in the year 2007 and got a thumping response from Astrologers and medical professionals and public in general. Swami Satyanand said "Service is greater than meditation", serve people whole-heartedly, willingly and untiringly. Let God's will, work through your body, mind and intellect. This is what exactly the author of this book has followed as this book serves as a service to the people. 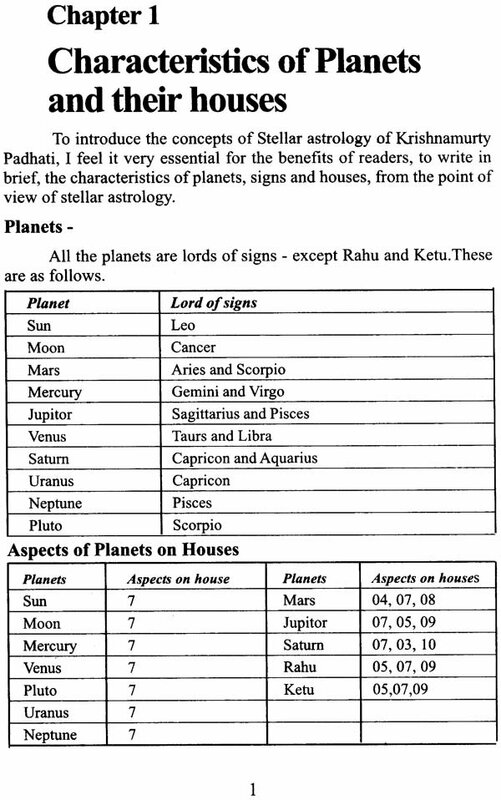 The author has almost relied upon Krishmurthy Paddhathi and the concept of ruling planets- 9 planets, 27 constellations (Nakshatra) and 12 signs as principal components in astrology which has also been recognised as service of stars and their effects on human life. The stars and planets are potential source of radiation, shaping human action and destiny. It has been accepted that the Moon being the nearest to the earth, exerts a powerful influence on mind and matter. When a child takes first birth and takes his first breath, the existing planetary cosmic rays (energy) enters his body and the ruling planets constitute the master key of good and bad happenings in his future life. The author has introduced a new chapter in his book. 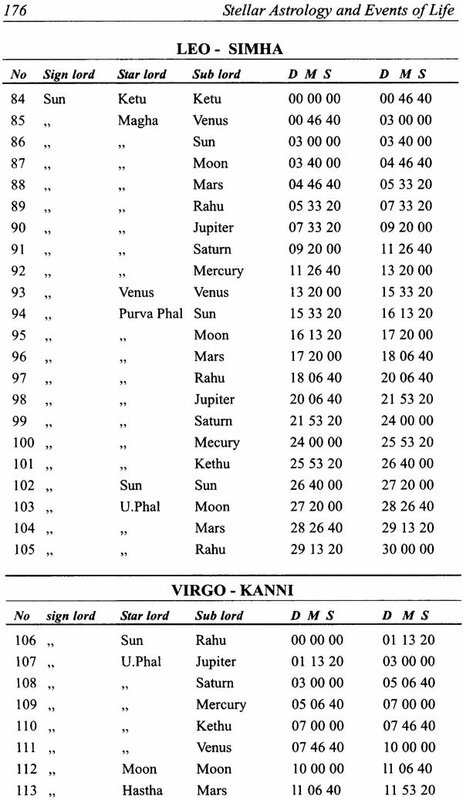 The role and importance of sub in Zodiac chart with the table under the caption. 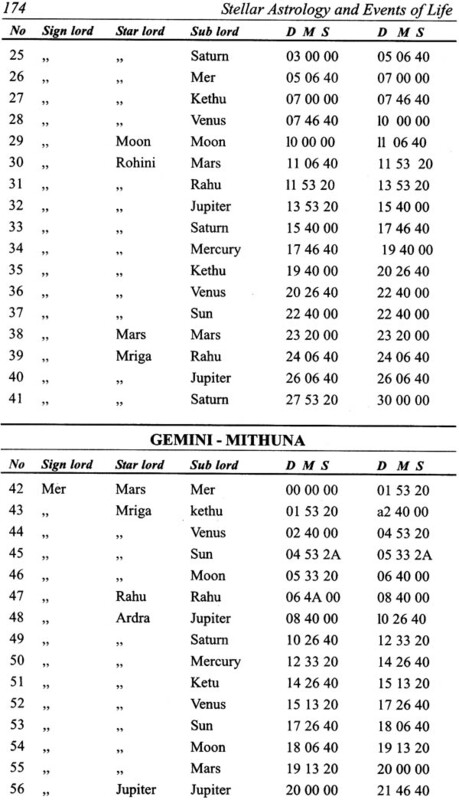 Table of sub helps to locate the cuspal position as well as planetary position which no one has done so far. I am very delighted to say that Dr. M N Muley, the author of this book has made a significant contribution to the traditional astrology and medicine after extensive research. The book is very useful for the professional astrologers and students interested in the subject. I congratulate Dr.Muley for his valuable contribution in Astrological field. I wish him good luck for further achievements. I have tried to cover all the important events of life, alongwith the variations in such events and made this book exhaustive, for the benefit of the readers, astrologers and students of Astrology based on Stellar astrology as practiced in Krishnamurti Paddhati. In this book, The case studies have been presented with illustrations with the help of the horoscopes of the natives, whose horoscopes, I have studied, and predictions have been made accordingly. The analysis of these case studies are in itself very educating and they can be used to analyse similar situations and reach a correct analysis and prediction. These horoscopes portray the different aspects or events in life which every astrologer comes across during day to day consultations. 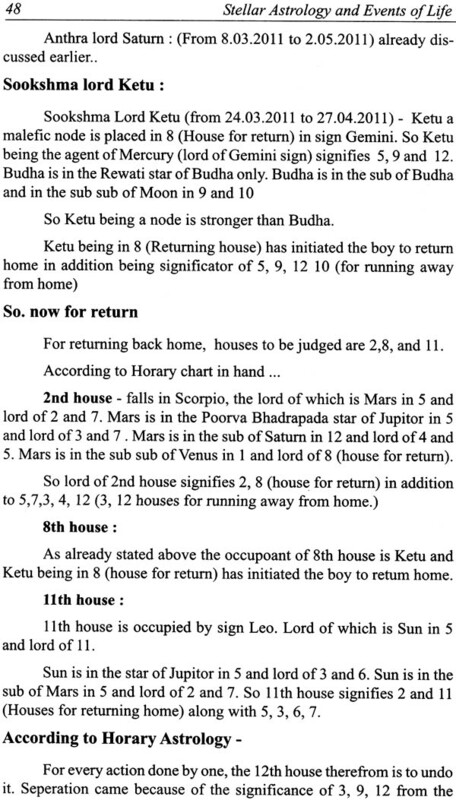 In the Introductory chapters, a short introduction about the characteristics of Planets, Signs, Houses, etc. 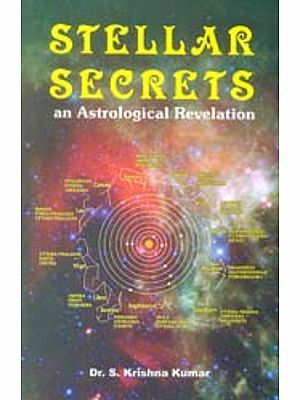 from the point of view of understanding Stellar astrology are given. There are two most important features of Astrology - one predicting an event and the second, timing of happening of the event. 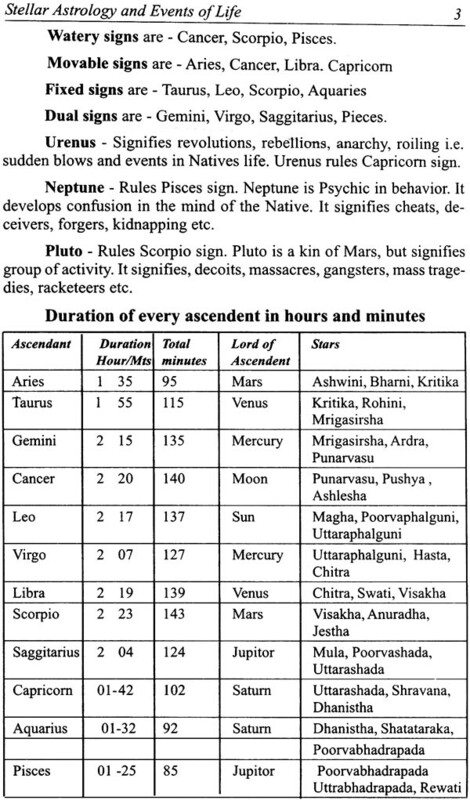 The entire happenings in the life of a native are contained in the Natal Horoscope and the only thing required is the accurate application of the Astrology of the event. 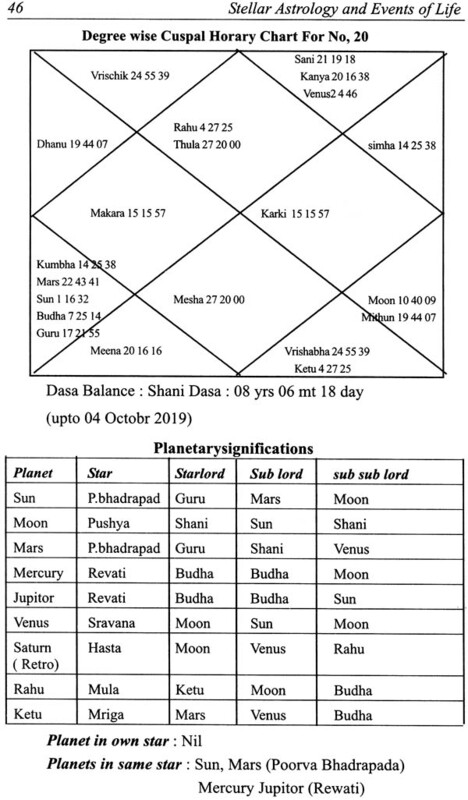 One can get the correct prediction - provided the exact time of birth and duration of Ascendant during which time, the birth of the Native has taken place. As is seen and observed, usually the time of birth of the Native is never found to be accurate and correct - and which needs rectification. 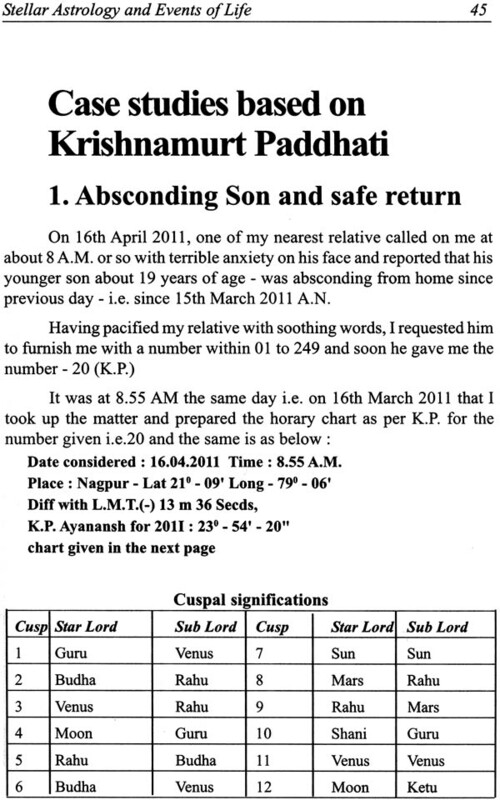 Rectification of exact time of Birth can easily be done - according to Krishnamurthy Paddathi with the help of Ruling Planets. After rectification of the time of birth is done, in order to find out whether the rectified time is accurate or not, can be found out for which rule is the sub lord of the Ascendant - whosoever, he maybe - must be the star-lord of Moon or the sign lord of Moon. But more emphasis is given on the star lord of Moon. So, the procedure to rectify the exact time of Birth and its verification for correctness can be seen in the book in the very beginning itself. Many a times, it so happens, that the consultant does not know the exact time of birth, place of birth, day except the year of birth and the place of birth. The care with which the predictions could be arrived at with the help of Krishnamurthy Paddhati has been well brought with these case srudies. 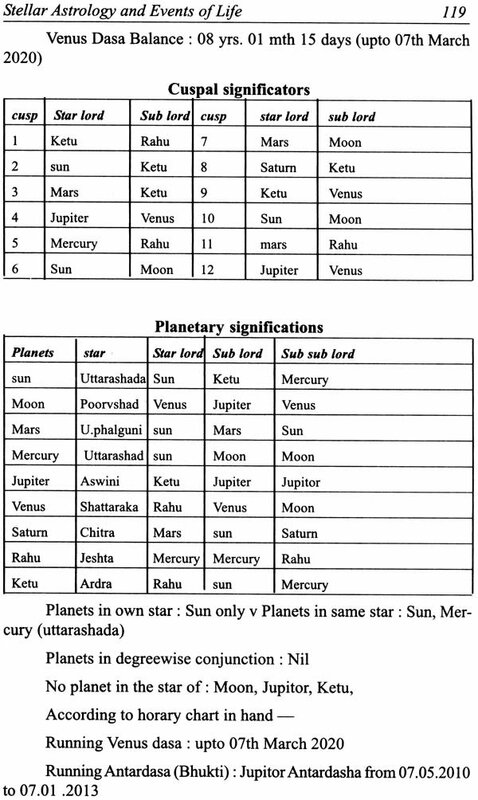 The Krishnamurthy Paddhati has been able to pin point predictions to a greater extent with the help of Stellar astrology. 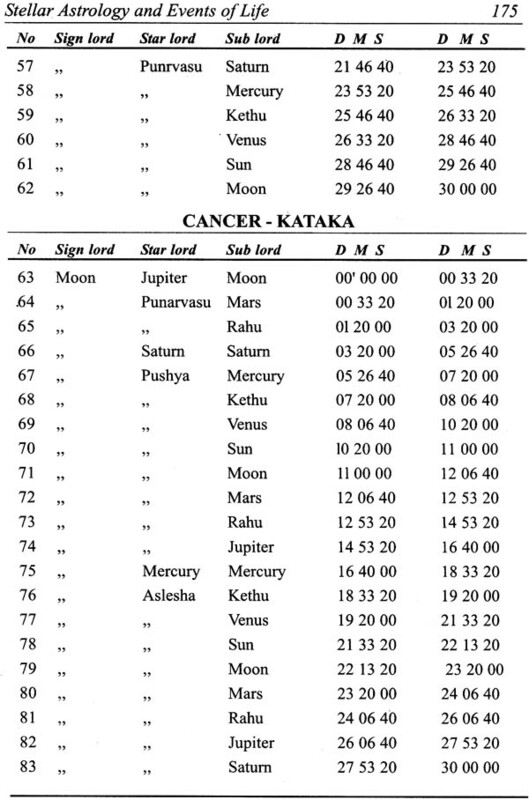 Everybody knows that in Krishnamurty Paddhati, there are total of 27 (Twenty seven) Nakshatras. These Nakshatras are divided in 249 numbers in proportion of Maha dasa. 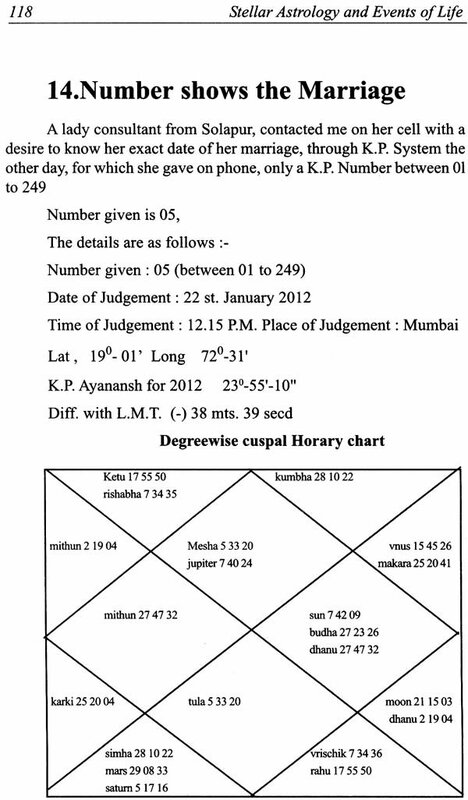 Every number indicates the Sign lord, Star lord and Sub lord, indicated in degrees, minutes and seconds and the consultant is asked to give any number within 249 and with the help of the sub or the number given question is solved and prediction given accordingly. I have gone a step ahead in this book and divided these Nakshatras groups into 2234 which indicates the sub lord. So instead of the numbers from 249, consultant is asked to give any number with no limitation for 249 and prediction given according to sub lord of the number concerned. The detailed table is appended in the book. One will find any number, given within 2234, will be within 249 only. Which gives more correct and accurate prediction. Example for No. 240 (from within 2234) solved is included in this book indicating thereby greater accuracy and correctness in predictions. I am thankful to Shri V.R. Upasani, Astrological practitioner, who offered his valuable help in suggestions and the guidance offered while writing this book, which I can never forget. I have to express my gratitude and thanks to, Shri Manohar Paraskar, Director of Sadhana Printers of Nagpur for preparing the master copy of the book. 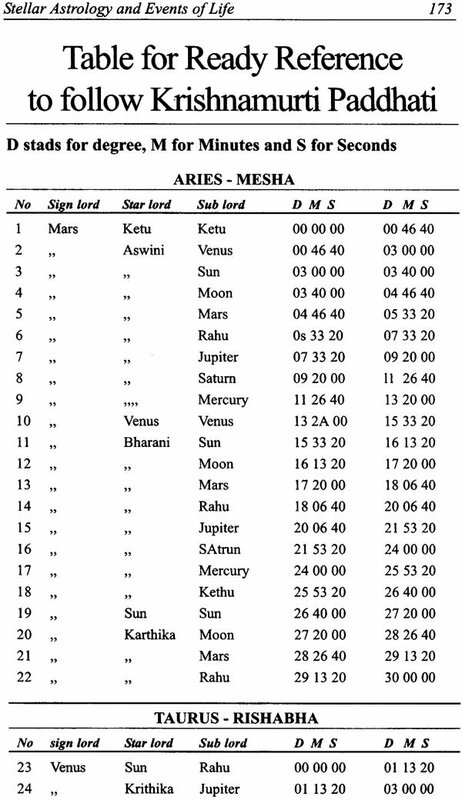 The typesetting of the book was done by the publishers in record time, considering the intricate nature of the horoscope charts and different tables. I sincerely thank Shri M. Easwaran, Editor of CBH Publications, undertaking to publish the book in the present form.